Type species: Mus volans Linnaeus, 1758, by original designation. Arbogast, B.S., Schumacher, K.I., Kerhoulas, N.J., Bidlack, A.L., Cook, J.A. & Kenagy, G.J. 2017. 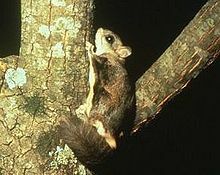 Genetic data reveal a cryptic species of New World flying squirrel: Glaucomys oregonensis. Journal of Mammalogy 98(4): 1027–1041. doi: 10.1093/jmammal/gyx055 Reference page. Glaucomys in Mammal Species of the World. This page was last edited on 19 March 2019, at 15:45.